If you’re looking to remodel your bathroom would you prefer to work with a contractor who tells you, “Lady – this is how we’re going to fix your bathroom” or one who asks, “Ma’am – how can we help you make this space fit your personality, style and needs?” Such was the choice facing Catherine Lee of South Euclid Ohio when she decided – for the first time – to contract out a remodeling project (all her previous projects she did on a DIY basis with her husband). 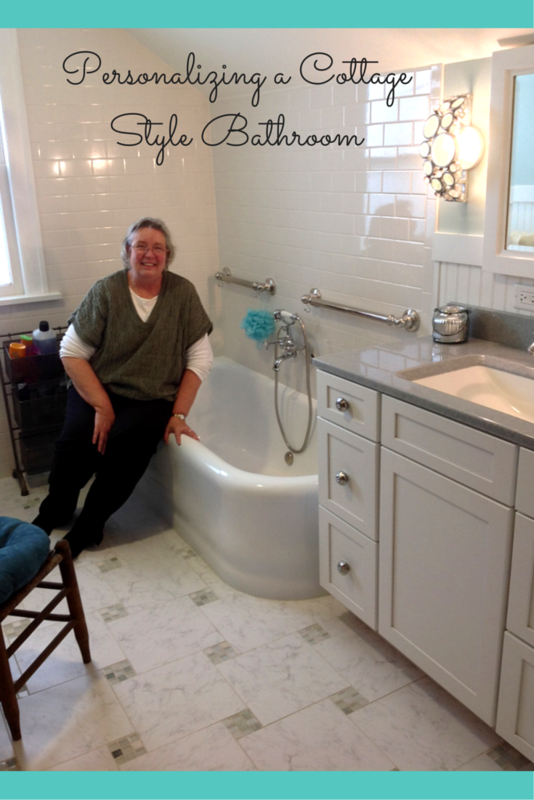 Catherine was looking to not only remodel – but transform – her 1919 main bathroom. This space had a beautiful vintage oversized cast iron tub and her goal was to create an artistically fun and relaxing space with the feel of a seaside cottage (despite being in Northeastern Ohio!). Learn below how Catherine along with the design (Jeff Merrell) and construction (John Fronek) leaders of the Cleveland Design and Remodeling division of Innovate Building Solutions were able to deliver on her vision at a budget she could afford. Electronic scrapbooking your vision – What’s cool today is you don’t have to buy expensive design and decorating magazines to show your vision to a contractor – you simply use the best sites to organize your dreams. Researching the Houzz and Pinterest sites Catherine was able to “cut and paste” idea books (on Houzz) and boards (on Pinterest) to capture her desired look. 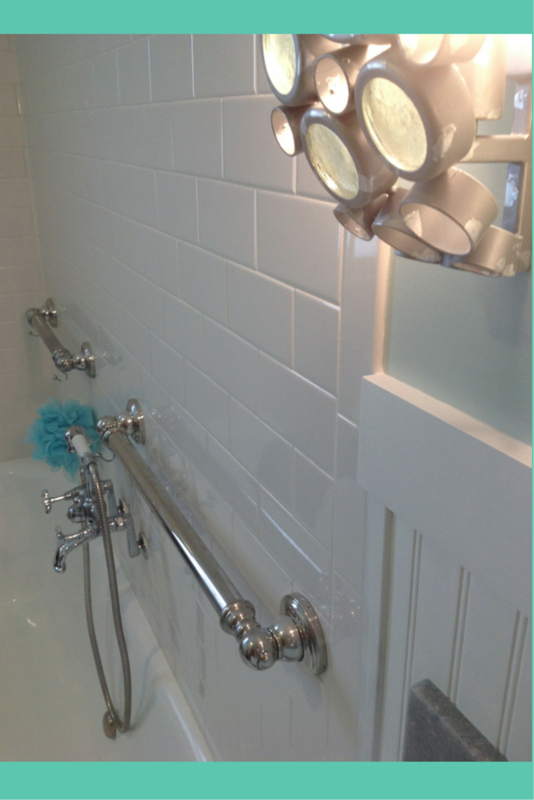 The idea to use clean white subway tiles for the cottage feel was just one of many ideas Catherine captured. Combining the dream with the pocketbook! – Any homeowner or contractor can create a fabulous space with a limitless checkbook – but that is not the reality most of us live in! With the assistance of Jeff Merrell (the Project Design Coordinator) Catherine was shown more affordable material choices which did not compromise the finished look. 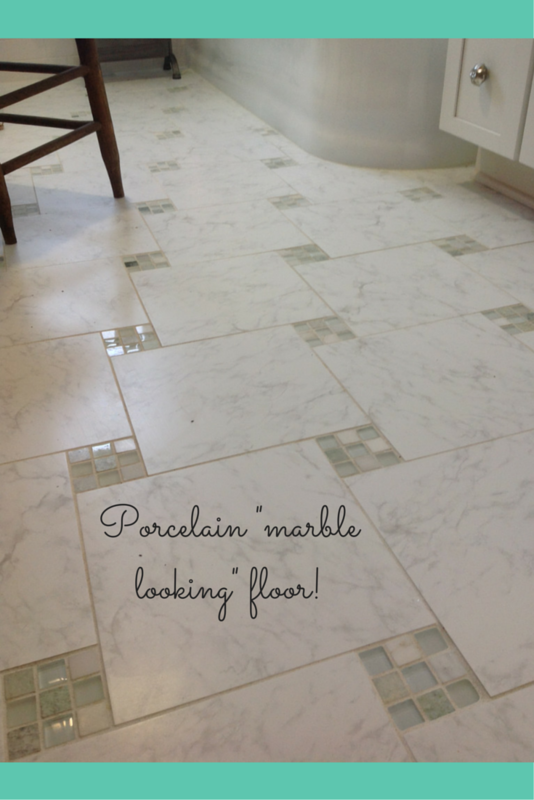 The porcelain (marble looking) tile floor and unique glass in-lays gave a unique look and feel of marble at a better price. The ¼” thick Masonite prefinished 4’ x 8’ sheets provided the bead board style without the cost of ¾” wide separate wood boards. Built to last with function, style, safety and a maniacal attention to detail – This bathroom not only didn’t look very nice in the beginning (the vintage tub was worn, paint and plaster was pealing) but it didn’t “work” well or provide a high level of safety (the existing pedestal sink provided virtually no counter space or storage and getting out of the high tub walls could be a challenge). 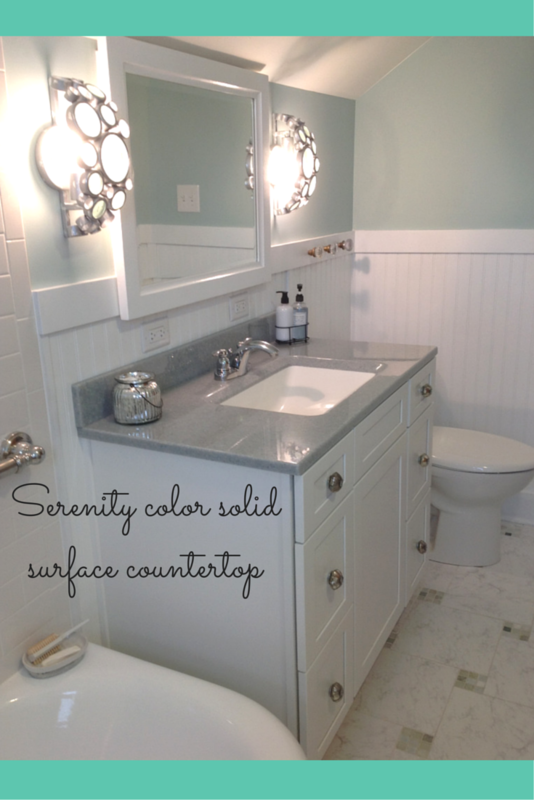 A vanity with a low maintenance, high style solid surface top – Catherine loves her multi-drawer vanity with a solid surface countertop which used the calming “serenity” color and integral white bowl. 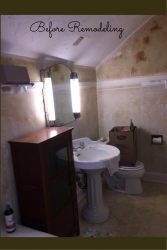 Decorative Moen grab bars, waterproof wall backer board and a fan – Making sure the project will stand the test of time and be safe was critical. Towards that end a waterproof wall backer board was used behind the tile walls, decorative grab bars were installed to assist getting into and out of the tub and an exhaust fan was added to pull moisture. A little bit of OCD – Often the difference between an OK project and an exceptional one are the details. John (the Operations Manager) is so OCD he even made sure the screws on the switch plates all went in the same direction! 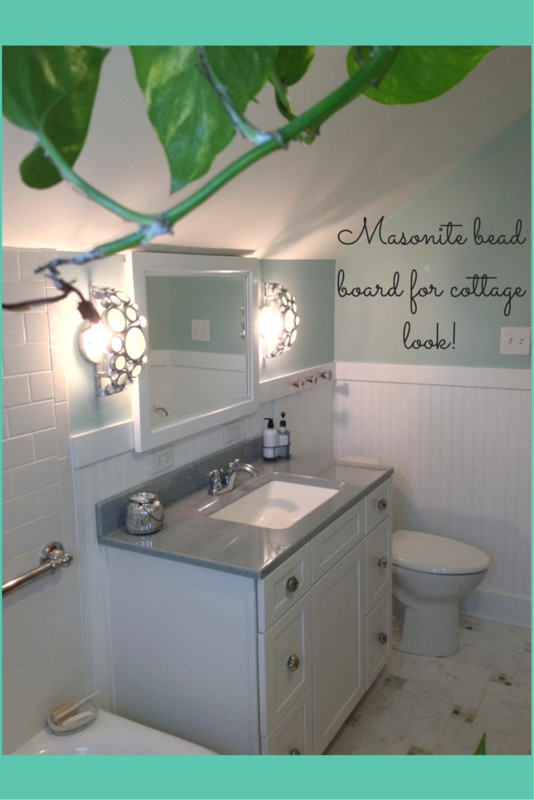 What do you think about this cottage style bathroom remodel? Which features do you like the best? 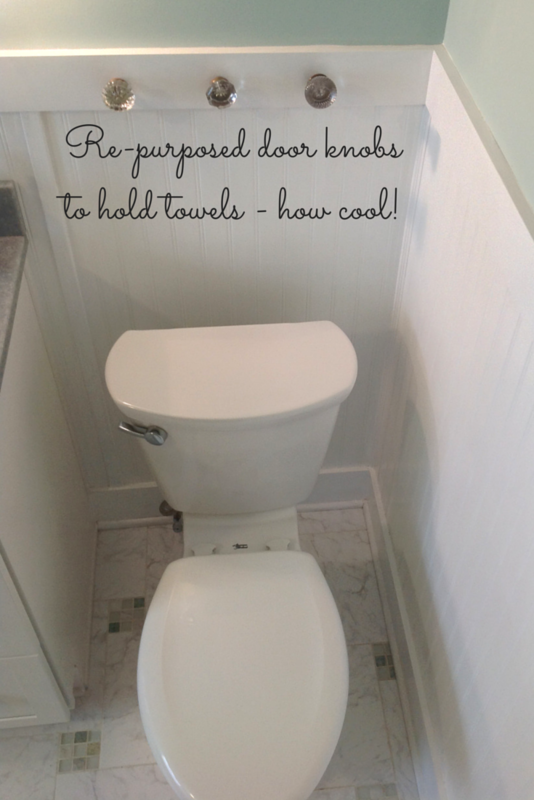 Please comment below or call us to learn more about bathroom remodeling. For a Cleveland bathroom remodeling project call Cleveland Design & Remodeling 216-658-1270. For unique nationwide bathroom remodeling products contact Innovate Building Solutions (877-668-5888).